According to the US Centers for Disease Control and Prevention, the second leading cause of death for children 1-14 years old is drowning. There are about 3,800 drowning deaths per year in the United States. That is over 10 per day, with about 20% being children 14 or younger. Parents should seriously consider getting their kids into some type of swimming lessons. 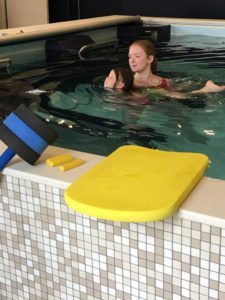 Here at Wise Physical Therapy & Sports Medicine in Grove City, we provide both private and group swimming lessons for children and adults of all ages. We have several skilled swimming instructors who can comfortably and effectively work with children only a few months old as well as competitive high school swimmers and adults who have either never learned to swim or are not as comfortable and confident in the water as they would like to be. Learning and improving swimming skills goes a long way to keep one from ending up a part of the above statistics. The set of skills learned and developed in swimming lessons have in many cases actually saved lives. The video below describes a situation where a young child was able to save herself with the skills she learned in a baby swimming class after falling into a river. Our private lessons are offered for 30 minutes ($20) and 60 minutes ($30). Our group lessons are offered for 8 sessions to groups of 4 that are at a similar age and ability level for 30 minutes ($50) and 60 minutes ($90). Call 724-458-9473 to schedule a lesson or for more information.